The first thing to realize is there are lots of setting controlling Windows 8’s sleep and hibernation. 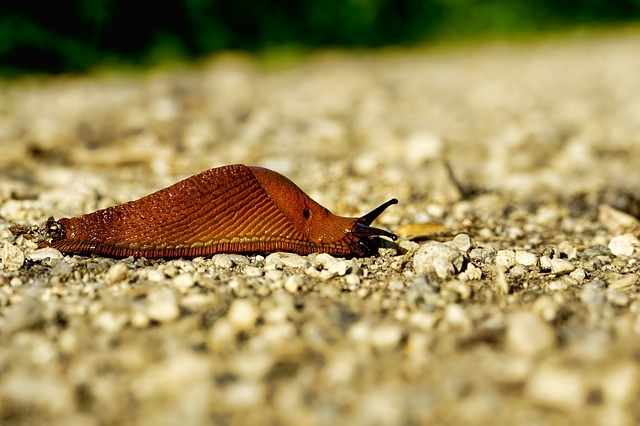 It follows that people experience a wide range of hibernating related problems. My point is that you have to work hard to find a description of the exact same sleep predicament that you are troubleshooting, but don’t worry, I have lots of scenarios to help you understand Windows 8’s snoozing habits. In a nutshell, Windows 8’s new hybrid boot technology results in a more responsive awakening from sleep than experienced in previous Microsoft operating systems. Finding the Power switch in the New UI is a little different from the classic Windows 7 start menu. Typical Microsoft, there are at least 2 ways of causing a machine to slumber! My favourite method is activating the Metro ‘Charms’ with Winkey +c, then choosing ‘Settings’. 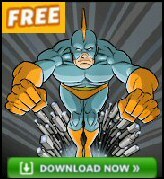 You should see the Power switch at the bottom right – see screenshot. Chris points out that WinKey +i would be quicker. A sleeping computer awakens quicker than if you set the same machine set to hibernate. The price to pay is that a sleeping computer could lose unsaved data if someone turns it off, this is because the information is stored in RAM, which is cleared if the operating system powers down. Although a hibernating machine takes longer to return to its previous state, the data is safe because it reloads the contents of a physical file called hiberfil.sys into memory. Consequently, if your spouse accidentally turned off your machine while it was hibernating your data would still be just as when you left it. Another benefit of hibernation is that it consumes less power than sleep mode. 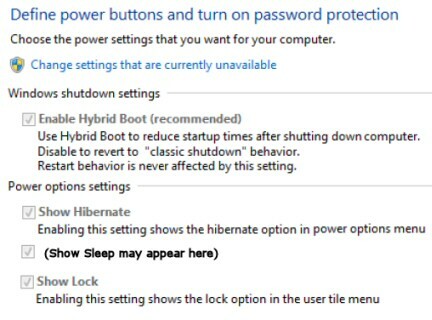 One more point, Windows 8 also has a setting called ‘Hybrid boot‘, which combines the speed of sleep with the data security of hibernate. Exit and restart your computer. Before you start changing the Power settings consider what you want to achieve, for example, conserving the battery, changing the Power Button options, altering the wake-up triggers, or simply improving security when you are away from the machine. Start your troubleshooting here: Control Panel -> Hardware and Sound -> Power Options. 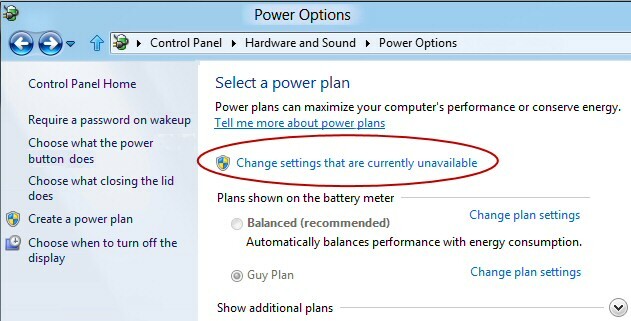 Tip: Even experienced users forget the significance of ‘Change settings that are currently unavailable’. Keep this link in mind if a setting is greyed out. Click on ‘Choose what the power button does’ – Key step, see menu above. This is where you can control what happens when the laptop’s lid closes, or when you press the Power button. If your setting is ‘Greyed out’, then remember my tip and click on: ‘Change settings that are currently unavailable’. 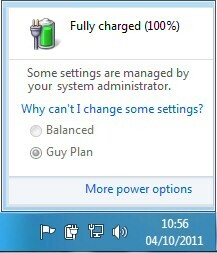 While I only show the ‘On battery’ setting, you can also decide what happens if the laptop is plugged in. Windows 8 has sensors that can detect a mains supply, and when the mains is turned off the operating system connects instantly to the battery, and then applies the appropriate power management settings. As you adjust the Power options settings as shown on the right, visualize the ‘Power’ button below. If sleep does not appear then check your BIOS settings. If still no ‘Sleep’ option, then my guess is that your display driver does not support this mode. Still stuck? Go back to ‘Choose what the power button does’ link. 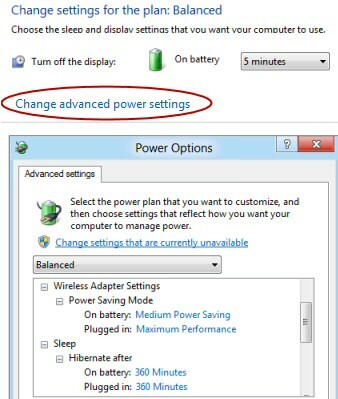 Power Options –> ‘Choose what the power button does’ is where you can enable or disable the new Hybrid Boot, this recommended setting halves the time Windows takes to reach the initial logon screen, largely because the Windows core processes retrieve hibernated files, where as drivers rely on a cold boot. However, for troubleshooting you can turn off Enable Hybrid Boot see above screenshot. Footnote: Hybrid boot is a separate factor from sleep. Why Computers Need to Sleep! For laptop users conserving the battery is a priority. Even for a desktop computer if it’s not use, then there are benefits from managing its power settings; namely, reducing electricity charges, peace and quiet, and in the summer, helping to keep the room cool. When I work with the graphics at maximum brightness, my Sony Vaio’s battery only lasts for about 2hrs. Therefore, anything that I can do to conserve battery power, will increase the time I can use my laptop away from the mains electricity. Please remember: Change settings that are currently unavailable. Windows 8’s Hibernation saves information about open programs to a file called hiberfil.sys, which you can inspect in the root of the C: drive. This hidden file keeps your data is safe even if someone switches off the mains, or removes the battery. 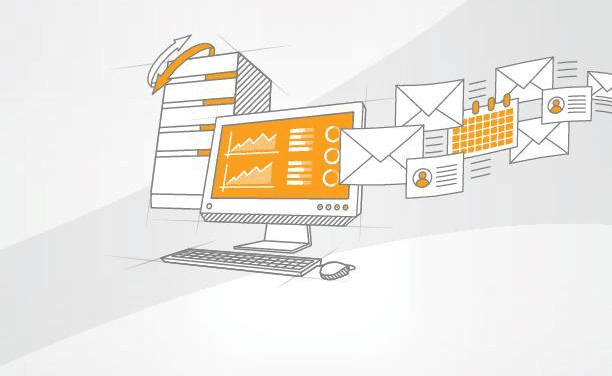 When the machine restarts, it loads information stored in hiberfil.sys and returns the machine to its former state quickly. To observe hiberfil.sys, and check its size, you may need to adjust the Windows Explorer’s settings. What I do is go to the Control Panel, Appearance and Personalization, then ‘Show hidden files and folders’. Plan B call for PowerShell and type gci c:\ -hidden. Once you understand the role of hiberfil.sys, then you appreciate why the Hibernation setting may NOT be present on the menu. For example, if there is insufficient disk space on the C: drive, or ancient BIOS software lacks the ability to ‘Suspend to disk’ or ‘Suspend to RAM’. Another gotcha with the Hibernate option, is that Disk Cleanup deletes the hiberfil.sys file. A solution to this recurring problem is to go to the command line, and type: powercfg -h on. 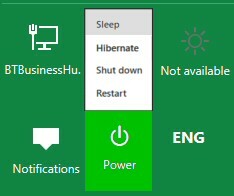 Windows 8’s Sleep saves your data to RAM and then switches to minimal power mode. There is a 4 second delay as Windows 8 switches back to normal power mode. In the event of a power failure you would lose any unsaved data which is stored in RAM (memory). At this point you will probably have to type in your password to resume after sleep; fortunately, ‘Require a password on wakeup’ is another configurable setting from the task list menu. Microsoft is partnering with ARM-based manufactures such as NVIDIA, Qualcomm and Texas Instruments to produce new Tablet devices for Windows 8. This ARM support will mean extended battery life as its RISC processor inherently consumes less power. Sleep and Hibernate settings will never be 100% reliable. I can report that my experience of the same Sony VAIO laptop was as follows: with Windows 8 it’s a pleasure to use Sleep, even Remote Desktop kicks-in straightaway. Whereas with Vista it was a lottery whether it would ever awaken without a hardware reset / reboot. My laptop’s Windows 7 experience was somewhat in-between, tolerable, but lacked the slick seamless coming-to-life of Windows 8. Does the Bios Support Sleep mode? Where is the Standby Menu Option? When Windows 8 has a problem, I am trying to train myself to begin troubleshooting by inspecting the Windows logs. At the new Metro UI type ‘ev’ and then look in ‘Settings’. 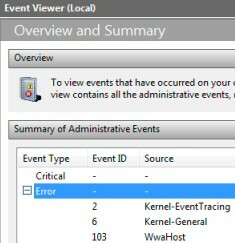 A good place to start in the Event Viewer is with ‘Summary of Administrative Events’. Follow-up by looking in the System Log and filtering for ‘Kernel-Power’ entries. Interesting items would include ‘The last sleep transition was unsuccessful’, or ‘The system is entering sleep’. If the computer has a ‘Certified for Windows 7’ then there is a good chance that all the power management features will work. It’s just up to you to configure Sleep or Hybrid Sleep, or else complain to the supplier / manufacturer. Idea: See if there any updates for your BIOS. If so a later version may cure your sleep problems. 2) Select your power plan. 3) Click: Change plan settings. 4) Crucial Links: a) Change advanced powers settings. b) Change settings that are currently unavailable. 6) Expand: ‘Sleep after’. If it’s a laptop check both the ‘Plugged in’ and the ‘On Battery’ settings. 7) Choose: ‘Never’ to prevent your computer going into sleep mode. USB devices are common causes for computers waking prematurely. In the case of accidental mouse activation, consider laying the mouse on its back until you find a better solution. 1) Control Panel –> System and Security –> System –> Device Manager. 4) See if it has a Power Management Tab. 5) If so, then remove the tick next to: ‘Allow this device to wake up the computer’. Select: ‘Wake up capability’. Choose ‘None’. i) You are bound to find suspects. ii) 95% of them will be innocent programs that need to be scheduled. iii) Good luck in weeding out the true culprit(s). Plan B) Blame a virus checker. Plan C) Blame a virus! Try a completely different strategy, investigate what is happening by using Performance monitor, however, this is a black art. I have an idea to cure computers that sleep, but won't wake up when you press a key. Tick Allow this device to wake the computer. Where Is the Windows 8 Standby Menu Option? Forget Standby. Windows 8 replaces XP’s Standby with Sleep. Do remember that you can ‘Switch User’ this will save the other person’s open files. Not really a sleep or hibernate setting, just an idea for a specific circumstance. Ever since XP it has been a worry to users whether a computer will actually awaken from Hibernate or Sleep. However, with each succeeding Windows version, sleep seems more reliable, and the Windows 8 computers seem to magically to wake-up when you tickle them with the mouse our Enter key. It has always been the case that power management is more important on a laptop than a desktop, consequently they have more components to configure, for example the battery, and also the lid.